The Book Chook: Let's Celebrate World Read Aloud Day! 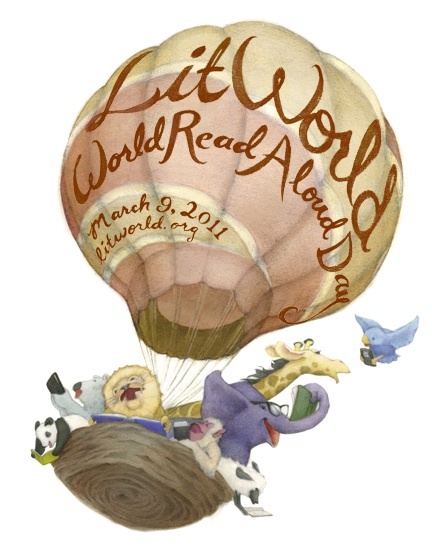 Let's Celebrate World Read Aloud Day! March 9 is World Read Aloud Day. You can read more about it on the LitWorld website where you can register to join the global literacy movement, donate, and find suggested activities to participate in. Their goal is to have us read 774 million minutes in honor of the 774 million people worldwide who cannot read or write. I love their slogan - "Words Changing Worlds" - it's so empowering. Angela Maiers tells us of a great project for classrooms to share reading aloud via Skype. You can sign up and join in via that link. At Ummah Reads, Saara challenges us to think of what we would miss most if were unable to read and write. At first it was so hard to imagine my life without reading and writing. Then slowly all the colour seemed to drain out of my day. Without the ability to read and write, I think life would be a grey wasteland. I truly believe that reading aloud to our kids is one of the very best things we can do for them. Of course we need to love them, protect them, feed them and respect them too, but to me, reading aloud is right up there with those necessities. By reading aloud to our kids every day, we are sharing the joy of reading, showing our kids what fun it is, motivating them to be involved in reading too. We are exposing our young kids to the pre-reading skills they need, things like acquiring a rich vocabulary, listening for sounds and rhymes, learning to predict and make sense of stories. If you have children under 6, you'll find many more simple activities to share with your child in Reading Starts at Home, by Michelle Breum. With our older kids, reading aloud continues the social side of reading, perhaps giving them a chance to revisit old picture book friends, or introducing them to new chapter books. No matter what age children we have, reading aloud is a special time with a parent's undivided attention, and a chance for kids to dream. Reading aloud is an absolute joy to me. I know not everyone feels that way, but it is an activity I didn't know was such fun until I tried it. If it's not something you usually do, I urge you to give it a go. There's no right or wrong way, just the way that works for you. World Read Aloud Day would be a great day to start a family tradition based around reading aloud. If you already have a daily read aloud time, but would like to mark the day as special, consider making little changes. Is it a day for reading aloud an old favourite, or for reading aloud out of doors, perhaps on a book picnic or trip to the park? Is it a day to read aloud to all the dolls and teddies, or to invite Grandma over and have her share the fun? How about a read aloud party where each guest brings along their favourite story to share, and then partakes of a feast based on book food? Although I'm more inclined towards A Year in Provence and The Faraway Tree than The BFG or Green Eggs and Ham! If you're interested in more ideas for family read alouds, you might like Ten Ways to Involve the Whole Family in Reading Aloud, Fourteen Fantastic Hints on Reading Aloud by Mem Fox, When Should We Start Reading to Kids?, Encouraging Young Readers, and Rhyme Helps Reading.